Ultrasonic cleaning is a tried and true way of removing contaminants from metal surfaces. An ultrasound generating transducer built into the tank produces ultrasonic waves in the fluid. 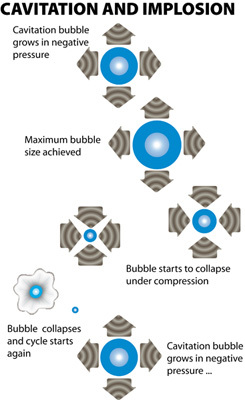 This creates cavitation bubbles, where the compression waves in the liquid tear the liquid apart, leaving many millions of microscopic voids which collapse with enormous energy, temperature and pressure. This action penetrates blind holes, cracks, and recesses to thoroughly remove all traces of contamination tightly adhering or embedded onto metal surfaces – in this case an entire amplifier, including the chassis and all wiring, switches, controls, connectors and tube sockets. Tarnish is one of the biggest performance problems plaguing vintage tube gear. It not only looks bad, it causes noisy connections, reduces high-end definition and introduces distortion. 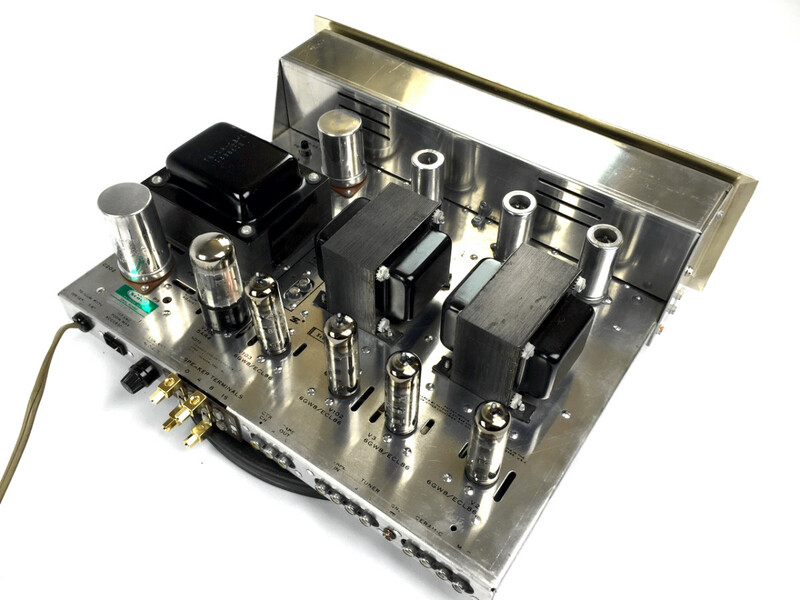 AEA has developed a new ultrasonic cleaning system that can remove tarnish and its negative effects from every part of your amplifier – inside and out. The results are amazing. You amp will not only look much better, it will sound much better. Tarnish is metallic oxidation primarily caused by atmospheric exposure to oxygen, ozone, hydrogen sulfide, and moisture. 60 plus years of exposure leaves nearly all surfaces covered with oxidation that causes distortion, noisy connections, loss of high frequency response and increased crosstalk between channels. Oxidation changes the chemical structure of metals, forming compounds that both block signals and distort them. The buildup can be extremely heavy in vintage tube amps due to their high operating temperatures and need for ventilation. It forms deep inside switches, tube sockets, controls and connectors. In most cases every metallic surface is contaminated; from the chassis to the wire leads on resistors and capacitors. Even the solder connections are contaminated with an insulating film of oxidation. And because older wire did not have insulating materials as durable as what is available today, it even coats the inside of insulated wires. We’re all familiar with the insulating property of tarnish causing intermittent and noisy connections, but tarnish also causes distortion. Non-linear distortion can be introduced whenever a signal flows through the junction of dissimilar metals. Even though this effect produces very small voltages, it can have a very audible effect on sonic performance. To make matters worse, this type of distortion is magnified by the high impedance of tube amplifier circuits. Until now it was impossible to remove tarnish from all the areas in an amplifier. Our exclusive ultrasonic cleaning process scrubs away tarnish, rust and built up dirt from every part of your amp. First we remove the faceplate and the power and output transformers. Then we immerse the entire amp chassis in a specially formulated cleaning solution that dissolves tarnish and rust. Heating it to 100 degrees and adding 400 watts of high power ultrasonic sound literally acts like microscopic scrubbers, reaching every part of the amp – down inside every crack and crevice. Every component, socket, connector, control, switch and connecting wire has 50 years of oxidation buildup removed. This process is completely safe for all metal parts and electronic components. Any component that can possibly be harmed is removed before ultrasonic cleaning. They are then inspected, tested, repaired if necessary before being reinstalled. We took the most grungy and corroded barn find amp we had and first cleaned it with a soap/detergent/water mixture and then hand polished it. The result is pictured in the first photo. Then we ultrasonically cleaned the amp in our solution and hand polished it. As you can see from the above photo comparison of the same amplifier, the results of ultrasonic cleaning plus polishing are astounding compared to that of traditional cleaning and polishing. Whereas only a small layer of corrosion was removed by cleaning the amplifier in a soap/detergent/water mixture and then polishing the amp, nearly all the corrosion was removed after a few minutes in our ultrasonic tank with our cleaning solution and a hand polish after drying. Now imagine this degree of corrosion removal over every surface in and on top of your amplifier – that’s the ultrasonic cleaning difference! *Do note that with ultrasonic cleaning there may be some slight loss of lettering on the chassis, as the process is abrasive.